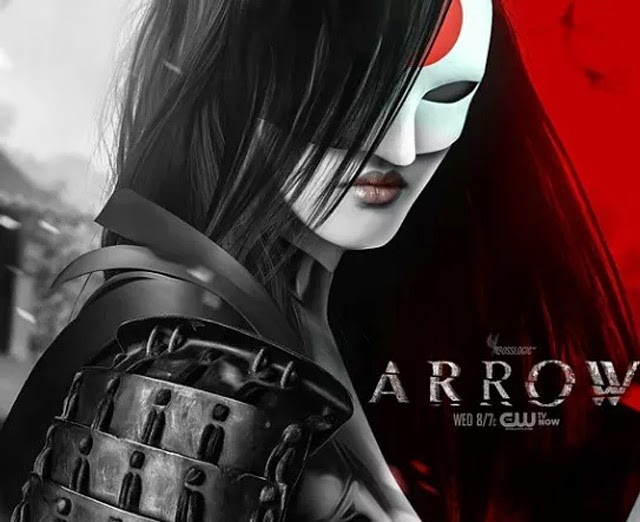 ARROW Season 3 Episode 22 Review: This Is Your Sword | Warped Factor - Words in the Key of Geek. This latest episode of Arrow certainly kept us on our toes! So many things happened in this episode! Where to begin? How about the beginning? As in the opening reel has now changed … again. “I spent the last three years defending my city” doesn't quite have the same ring as “After five years on a desert island,” but it is an improvement over “After 5 years in hell ...” Nice work, CW. You're on your way. And now we know that Oliver is officially not signed on for the League. … But seriously, none of us were fooled; however, I suppose the big question was whether Oliver was merely acting or under the influence, so regardless, we can all now rest assured of Oliver's true allegiance. Congrats, Team Arrow, on securing the vote of the superhero you're named for. 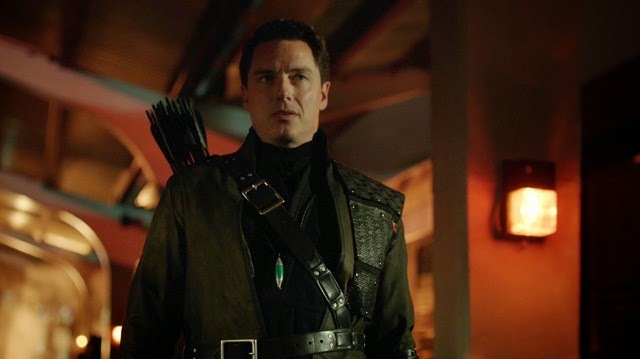 I think the real question to be answered this episode was where do Malcolm Merlyn's loyalties lie? To be perfectly honest, Merlyn doesn't necessarily lie, so much as know how to bend and expose the truth to his advantage. For example, he didn't literally kill Sara Lance; and Oliver was, in fact, the snitch. So it really came as no surprise when we discover that Malcolm, per usual, is merely looking out for Malcolm. But, I guess, who can blame him? This guy literally has no friends anywhere – he has skills and resources that make him useful sometimes, and he apparently can go back and forth to Nanda Parbat at his leisure (which, correct me if I'm wrong, wasn't that like nearly impossible only a few episodes ago? The team has seriously been back and forth to this “hidden location” almost a handful of times in just as many episodes. I'm starting to think Hogwarts is more off-the-grid than this Ninja Palace.). And in case Malcolm didn't bother me already, he had to go and say the word “charade” (as in “shah-rahd,” apparently not to be confused with “shah-raid”). Malcolm, you just can't win this episode, can you? At the very least, you've given me a chance to focus my displeasure on someone besides Laurel. So maybe a little winning there. Speaking of Laurel and her crew, I found it hilarious that even the addition of another hero (and we all know Tatsu/Katana is AWESOME), this group just can't help but fall apart in angst and displeasure whenever Oliver is gone. Everyone is excessively angry and aggressive this episode – John, Laurel, Felicity. The only truly “chill” character seems to be Ray, and this guy's always been inhumanly positive. I mean, the man manages to break up with Felicity, stay friends, join the team to get back his ex-girlfriend's new boyfriend and potentially give away Queen Consolidated/Palmer Technologies/soon-to-be Smoak Incorporated, all without losing his charm and endearing nerdy commentary? Dang, he really is Superman. 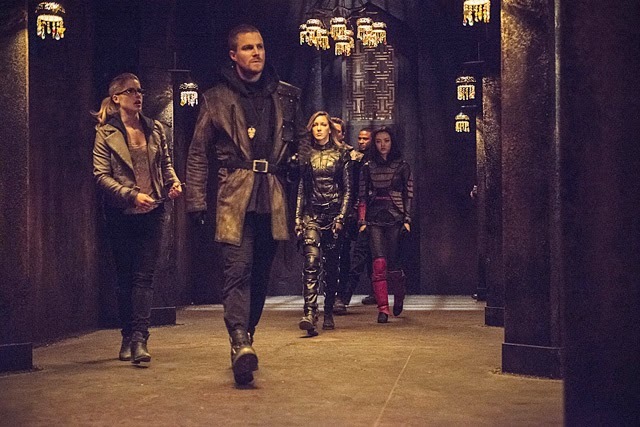 But, I have to hand it to them, Team Arrow does seem to hold their own against the League of Assassins. Even Felicity seemingly sticks it to a bad guy with a toss of her hardware, only for her to realize that it “makes more sense” for Malcolm to have shot him with an arrow. Oh well - Felicity, you still win forever in my book sans fighting skills. (For more reasons why I love Felicity, be sure to read my article from last week. Is it a little obvious that I have a major character crush on this sassy computer genius? No shame.) And – as mentioned above – Katana is AH-MAZ-ING! I love that Tatsu finally gets to be a part of “the present.” I hope she'll stick around for Season 4, especially now that her entire family is gone. Speaking of which, I feel as though “Most Killer Couple” award now goes from John and Lyla (because they're both skilled assassins/soldiers/agents) to Tatsu and Maseo based solely on the awesome fight sequence they share in this episode. While poor Tatsu can't seem to catch a break with the men in her life (first she loses her son and now her estranged husband), she and Maseo give the term “lethal love” a fresh, new meaning. Killing your husband in order to set him free from his guilt? Wow. That's true love. I hate that we had to lose Maseo, but let's face it, we have plenty of angsty characters already on this show (::cough cough:: Laurel … and Captain Lance). And with the death of one major character this episode, I think we all called the bluff of killing off the entire team with the Alpha and Omega. No one in the cell is exhibiting any of the symptoms we saw in Hong Kong, so don't get too upset. We all know Team Arrow isn't gone for good. However, we may've seen the last of Roy, at least for a while (let's hope the rumors for a spin-off are true). But – get excited about this – Season 4 might bring forth a new sidekick for the Arrow: Speedy! You guys, I can't begin to tell you how excited this makes me. 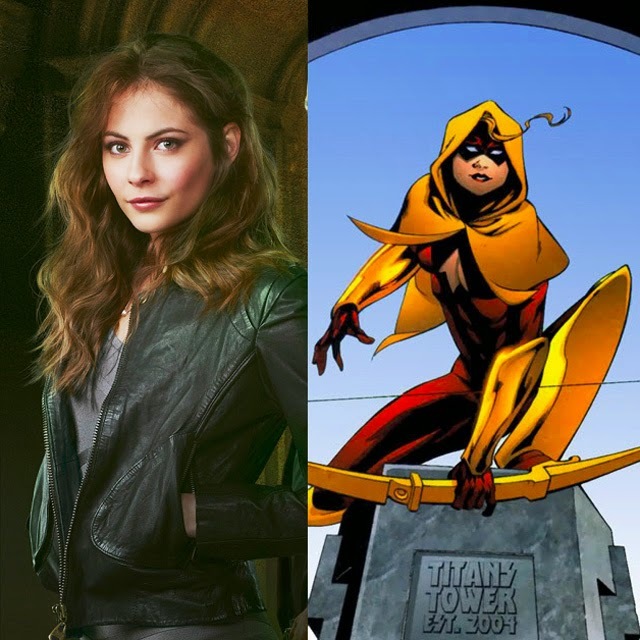 I suspected it originally when Thea began training with Merlyn, then I prayed it might be true in the last episode when Thea shows up to fight Oli as a hooded archer. But now it's almost certainly happening – after all, “red looked better” on Thea. We can only hope to catch a “quick glimpse” of the youngest Queen kid as her new alter ego in the upcoming finale of Season 3! Until next time, friends!